Their sprinter’s out of the race, and their general classification rider is out of sorts, but Omega Pharma showed their versatility and strength in depth when Tony Martin took a solo victory in stage nine of the 2014 Tour de France in Mulhouse. Versatility and strength in depth are words that can also be used to describe Martin, who has already been seen off the front of the race over the cobbles of stage five, and marshalling Omega Pharma’s sprint train in the final five kilometres of the flat stages. But today, he was in his element, turning the stage into his speciality, time trialling. He attacked his breakaway partner, Alessandro De Marchi, on the penultimate climb of Markstein, with more than 60 kilometres to ride, and rode alone to the finish. Behind Martin, another Tony, Frenchman Gallopin, was riding into the yellow jersey with the visible co-operation of the Astana team, whose leader Vincenzo Nibali will be happy to relinquish the responsibility of the race lead, even if for only one day. Gallopin infiltrated a huge second group, initially containing 28 riders, who tried to bridge to the lead duo over the early climbs, but just fell short. The group, which shrank over the course of the day to 20 riders, settled into the increasingly large gap between Martin and the peloton. They were 2-45 behind Martin at the finish, but importantly, another five minutes passed before the peloton ambled into Mulhouse. Gallopin will now wear the yellow jersey for Bastille Day, a very hard day through the Vosges mountains to the first significant summit finish of the race at La Planche des Belles Filles. Omega Pharma have responded well to losing their sprinter Mark Cavendish on the first day. Michal Kwiatkowski remains in sixth overall, despite looking vulnerable yesterday, and Matteo Trentin won two days ago in Nancy. With another long time trial to come, Martin may end the race with another stage win. Their fellow Belgian team Lotto will also be pleased, with Gallopin wearing the yellow jersey, while Astana will be relieved that they don’t have to take responsibility for pacing the peloton in tomorrow’s tough stage. He also paid tribute to the roadside support from German fans, who’d streamed over the border to watch the stage. 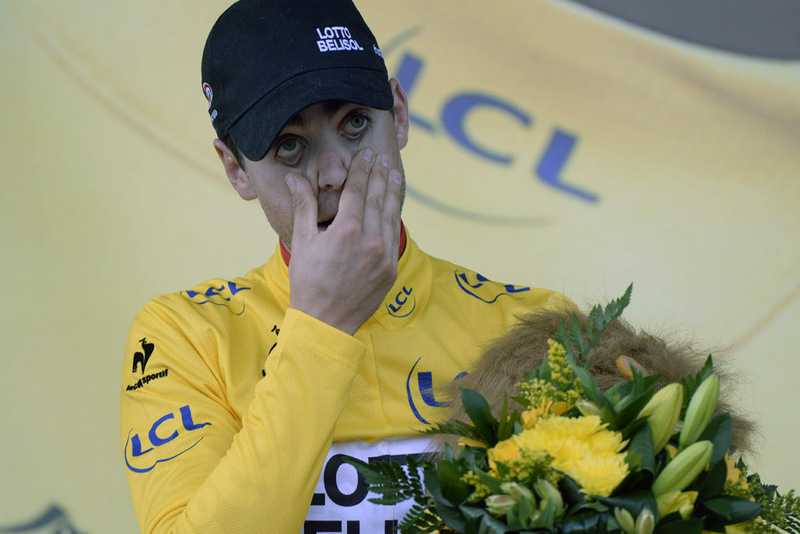 The Tour has famously been ignored by German television for years, since doping scandals dented the sport’s popularity.